What makes this clock especially interesting is its changing appearance from day to night. 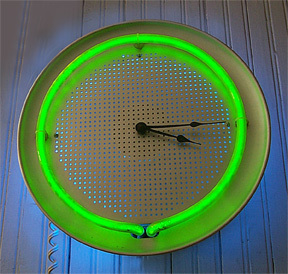 The pizzaClock has a front piece of perforated aluminum backlit with neon. It comes in clear-coated silver aluminum, black or translucent-color coated. The clock mechanism is electric, not battery. The colors of the two neon tubes can be made in any color combination upon request.